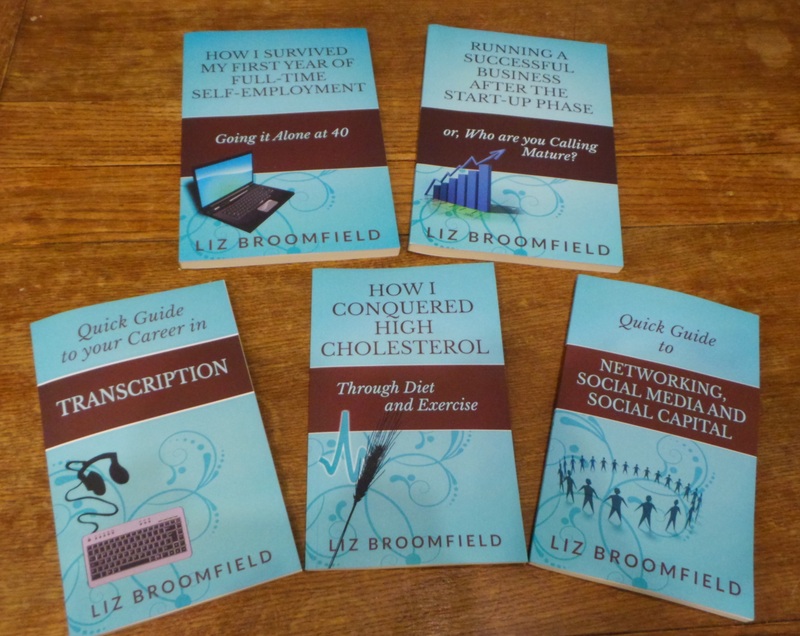 I was thrilled to find my thirteenth five-star review (twelve on Amazon.co.uk and one on Amazon.ca) for my book, “Quick Guide to Your Career in Transcription”, from a lady who’s now read three of my books (even better!). I have been popping reviews onto both my review blog and Amazon for books I’ve read lately, as I know how much it helps authors to get feedback on their books – especially when they’ve helped and/or entertained people, of course. This book has obviously struck a bit of a chord, as I get more emails and contact about this topic than any of the other ones I talk about in my books and on my blog. With that in mind, I’m trying very hard at the moment to work this into a full-length book on transcription careers, based on my “Your Guide to Starting and Building Your Business” to add to the special editors’ edition I’m also putting together. These will be available in print and e-book versions automatically from publication, as I’ve found that the popularity of my print books is growing. Do you prefer to buy non-fiction, informational style books in print or have you swapped to e-books for those? I’d love to know! 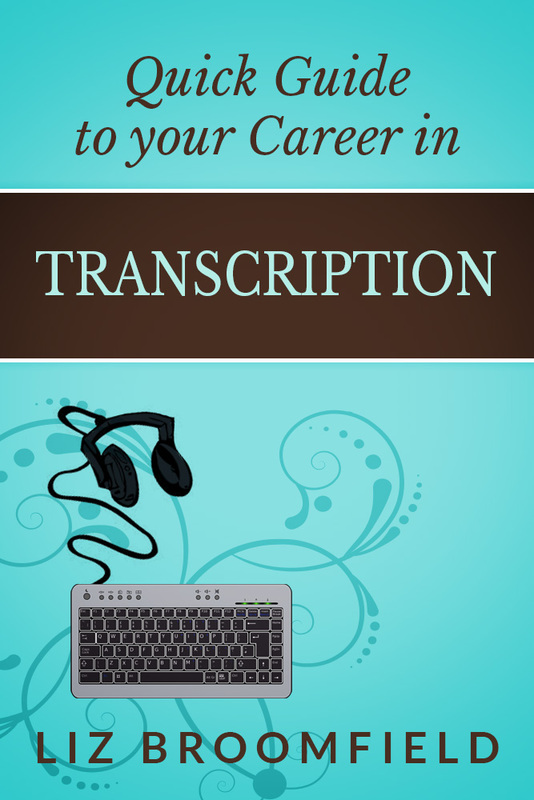 For more information and how to buy, visit the “Quick Guide to your Career in Transcription” page. I had an email enquiry in the week from someone who had read “Quick Guide to your Career in Transcription” but wanted to ask for a little more detail on a couple of points (one of which was more about general business stuff, one of which was about how to check your typing speed). I was very happy to hear from her, as I’d always much rather be able to fill in any gaps myself and have a happy customer. I did mention in my reply that it would be great if she could pop over and add a review for my book on Amazon – and she did! So if you’ve written a book and you’re wondering whether to include contact details, I think it’s a good idea. And if you’re considering emailing an author, I’d say do it – we always like to hear from our readers (even constructive criticism, as happened with one of the reviews on this very book) and I always like to take the opportunity to help someone. For more information on this book (with its 11 five-star reviews!) and how to buy, visit the “Quick Guide to your Career in Transcription” page. When I got a bit of a bad review on my single health-related book,* “How I Conquered High Cholesterol“, (well, everyone has to have at least one one-star review, right?) I was chuffed when two readers leapt to my defence, meaning I didn’t have to do that ill-advised thing of replying to a review (the only review I’ve ever responded to publicly is one on this book that complained the images aren’t visible. As this book has no images, it seemed pertinent to mention that as an addition to the review). And with 22 reviews now, this, my book with the highest sales (although not this month so far, as “Quick Guide to your Career in Transcription” has surged past it), is now catching up with “How I Survived my First Year of Full-Time Self-Employment“, which has 25. I assume all writers are obsessed with this stuff? I hope so, anyway. Edited to add: I’ve just found out that if you go into Amazon and enter “high cholesterol” into the search box, this book comes up top of the search results! Hooray! If you’re an author, it’s worth checking if this happens for your books, too. * After having apparently cured the lady who does my cleaning’s IBS (Irritable Bowel Syndrome) with what can only be described as “one simple tip”, I am considering doing a book on IBS. Do you think this would be a useful addition to my stable? 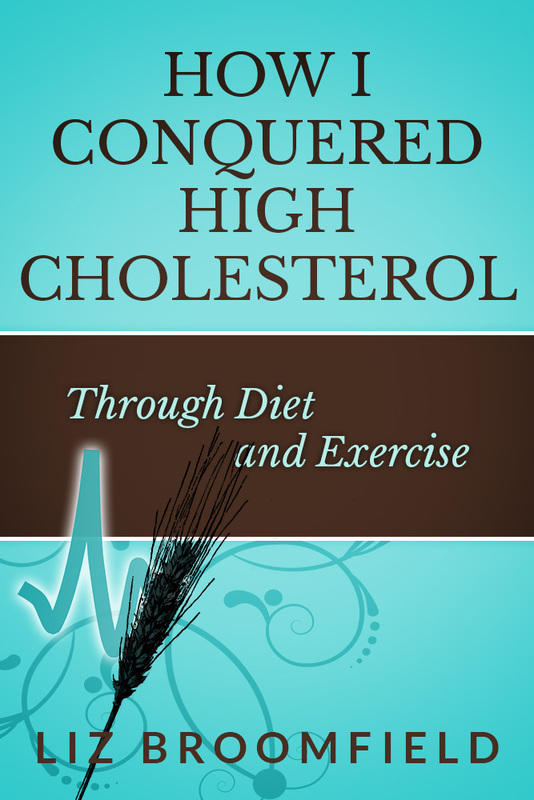 Find more information about “How I Conquered High Cholesterol” here. And if you want to find the mean review, it’s on the Amazon UK page for this book! A lovely new review for “Running A Successful Business after the Start-up Phase”! I’ll be honest here – I’ve never quite marketed this book correctly. First of all, I called it “Who are you Calling Mature?”, a title which I had tested on people but which, it turned out, made people think it was a book about ageing disgracefully (oops) – even though it had the same cover as you can see here, but with the title and sub-title reversed. So I rejigged it all, got the cover re-done, re-did all the versions on the various platforms where I sell it, and tried again. I still think I’ve got the title wrong, though. It’s all about social media, building your business, knowing when to say no and when to say yes, picking your customers, etc. – which is actually useful for start-ups as well. Anyway, whatever’s happened, it’s always lagged behind my other books, although it does better when it’s part of my omnibus volume, “Your Guide to Starting and Running your Business“. What all this is leading up to is the fact that I was thrilled to get a lovely new five-star review for this book, especially, as – you guessed it – the poor thing lags a little in the review numbers, too. I know I labour this point, but this is why reviewing books you read, especially those from small presses and independent authors, is so important – it cheers us immensely, for a start, and this review, with its explanation that it’s useful for all stages of business life and talking about social media, too, helps other readers to find the book and make use of it. 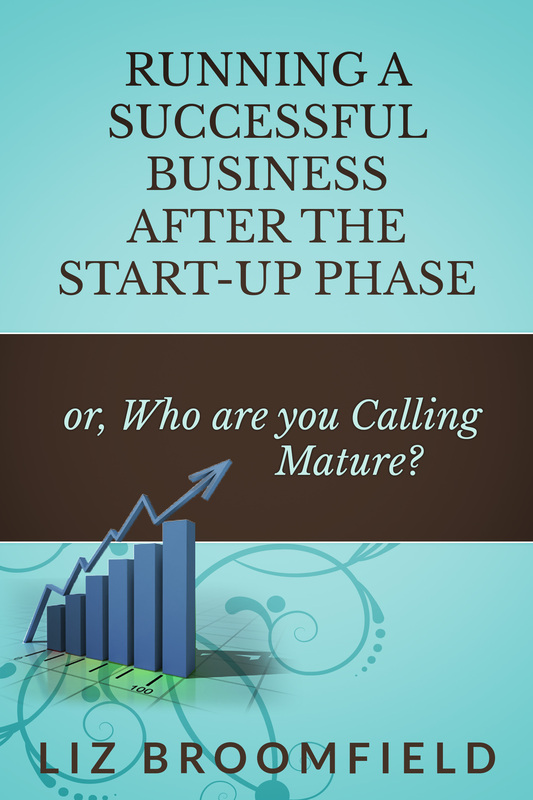 Read more about “Running a Successful Business after the Start-up Phase” here or pop straight to its page on Amazon. Is it worth producing print versions of your e-books? At the beginning of this month, I shared the news that I’d finished producing print versions of my three smaller e-books and that they were now available. At that point I was quite tired; I’d been slogging away through the admin of getting new covers (from my cover designer), getting them formatted appropriately (by myself, including loads of fiddling around, turning links into footnotes and goodness knows what else) and uploading them onto CreateSpace. Phew. I had done this because a few people had overtly said to me that they wanted to buy print editions, and I’d run some informal market research which suggested that enough people still read print books – in fact some commenters strongly suggested that I produce all of my business books in this format because they liked adding notes to their books which was easier with a pen, some sticky notes and a “real” book than with an e-book. So it got done, and I was really busy, and it was a bit of a chore, but it was all done. Then we went away on holiday (hooray!) and I sort of forgot about it. So much so that I – gasp – forgot to look at my statistics! Goodness me! When I had a look at them, I was pleasantly surprised. We’re almost half way through the month and I have sold some print books (and these don’t include the ones I ordered for myself to check they’re OK). Interestingly, although I haven’t sold the number that I sell in e-book versions every month, the proportions are about the same across the different titles. That’s fine, and I suppose what I would have expected if I’d thought about that aspect. Now that the effort is over and they are starting to pay for the only real monetary cost (the covers – yes, I know: my time, my time, but I did slot them in, in between paid jobs and didn’t turn down any paid work to have the time to do them). In future, I’ll bring out simultaneous print and e-book versions of any new books I produce (I have a version of my two business books aimed at editors coming out in the next couple of months). I’d be interested to know about other indie publishers’ experiences – have you done one format then the other or did you start with both? Which is more successful, and do you know why? Would you recommend it? 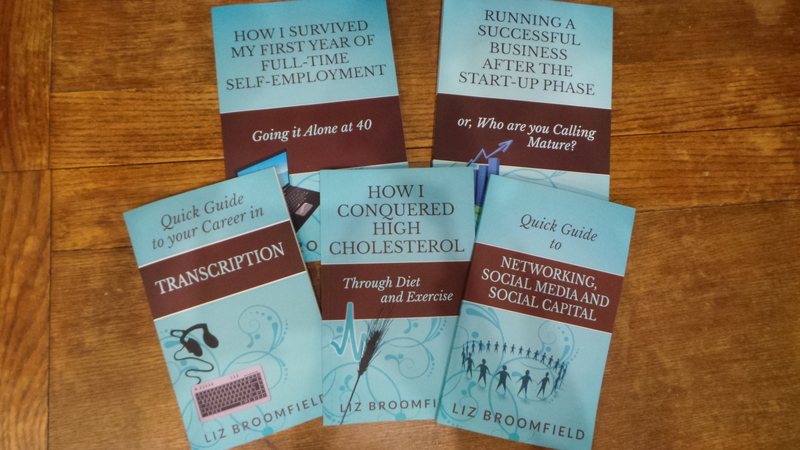 You can find out more about my books on running a small business (and dealing with high cholesterol) here. The ninth five-star review for “Quick Guide to your Career in Transcription” on Amazon.co.uk (and tenth five-star review in total) was posted this week! This is definitely a book I wrote in response to interest, as I noticed that I was getting a lot of searches coming through to my website on transcription, transcription careers, etc. I’d been writing odd bits on the subject but put this book together – and I’m so glad I did! I’m hoping to produce a printed version, too, after a couple of enquiries convinced me that that would be a good idea – watch this space for news on that one! So it’s certainly working for me having as many different formats and platforms as I can! Stop press – all of my books are now available in PDF via the Selz website – you can buy using PayPal, too! I was particularly pleased to receive this after a rather horrid and misleading review on my Cholesterol book which I’m not going to dwell on, but was quite upsetting when lots of people are going to be looking at that book after spotting it in the magazine. If you have read and not reviewed that one, well, I’m hoping some new reviews will push the one-star one down the list of recent reviews a bit. Anyway, I’m really pleased to have my Canadian review! If you’re in Canada and want to have a look at my books on Amazon, they’re listed here. A quick note while I’m here – Amazon have put up my UK and EU e-book prices a little bit, to take account of the VAT increase imposed by the UK and EU governments but affecting us small sellers and buyers more than the big guys it was aimed at (search for VATMOSS or VATMESS for more info). I’ve left the changes as they are for the time being, to see how things settle – it’s only added about 10p to the cost of my most expensive books, so hopefully that won’t be too much of a burden. Want to read this book? Have a look here for info and links to Amazon, Smashwords, etc., where you can buy. I was interviewed by journalist Jo Willacy a few months ago and here’s the result – a lovely feature in “Healthy”, the UK’s top well-being magazine, which is stocked in Holland and Barratt health food shops. 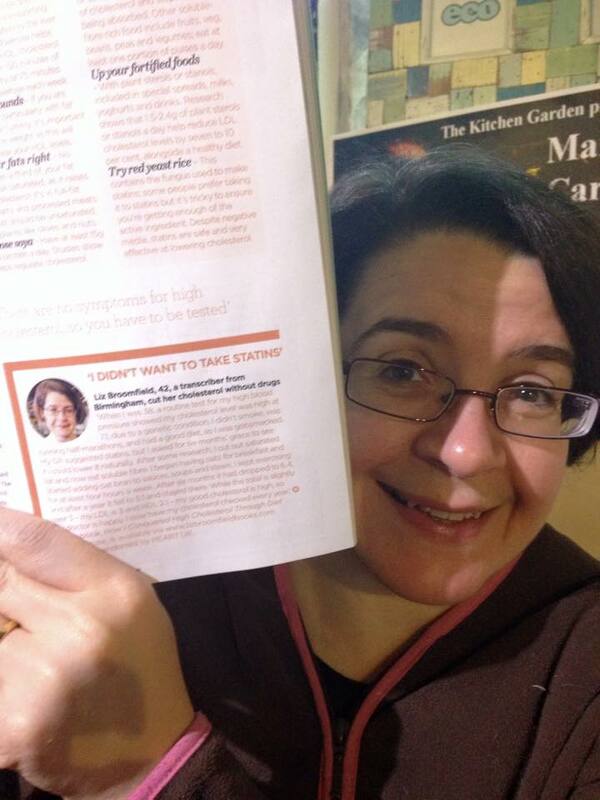 I was really chuffed to find myself in the mag, with a lovely write-up and a mention of this website (so, hello to anyone visiting after reading the article!) and the book I wrote after bringing my own cholesterol levels down myself. Excellent publicity, and I hope this will help my book to help more people in the New Year! Let me know if you’ve spotted the article in your local Holland and Barratt shop (it’s on p. 53), and thanks to the friend who put the journalist in touch with me in the first place. You can read more about “How I Conquered High Cholesterol Through Diet and Exercise” and find links to buy it here. I was chuffed to notice a new review for my book, “Quick Guide to your Career in Transcription“. This one is flying off the (virtual) shelves at the moment, which is cheering as I put together my next offering, another in my “Quick Guides” series. This one on transcription gathers together all of the useful information I wished I’d known when I started doing transcription work (flailing around using non-optimal technology and without the huge range of shortcuts I’ve developed over the years). Transcription is a huge and valued (and fun!) part of my work life; there’s plenty of work to go around and I’m always glad to spread the word: it’s lovely when I hear back from happy readers! This e-book was excellent and to the point! I have been considering starting my own transcription business for a while now and this has given me the extra knowledge and confidence I needed to pursue it! Highly recommend it!! How lovely! Thank you to this Amazon reviewer, and I hope she does well in her business!